365 Things Every New Mom Should Know combines prayerful, playful, and above all practical information with thoughtful devotions to energize new moms seeking to treasure every moment of a baby’s first year. 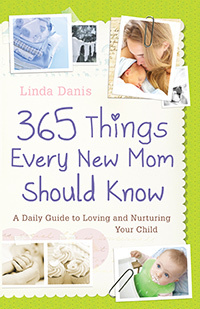 Designed for ease of use, 365 Things Every New Mom Should Know will inspire any new mom—whether it’s her first baby, or, in the case of the author, her fourth! A great gift for anyone who wants to lay a foundation for motherhood that will last a lifetime.